Home announcements Application game Games Review Help Professor Pym Discover The Hidden Secret Of The Toxic Steam! Help Professor Pym Discover The Hidden Secret Of The Toxic Steam! We’re proud to introduce the winner of our Weekly Free App Poll – meet Professor Pym and the Secret of Steam by Naoplay! The fourth game by this fledgling studio invites iOS users into a charming steampunk-inspired world loaded with easy “One-Touch” single finger gameplay! You can check more details below, but before moving to particulars, it should be said that Professor Pym and the Secret of Steam offers a perfect dose of casual fun, while leader-board achievements give more serious players a real challenge as they scramble to escape the rising waters! Introduced just on July 12th for iPhone, iPod touch, and iPad, this exciting new game ready to challenge your reflexes and timing! The gameplay is appealing for both casual and dedicated players. 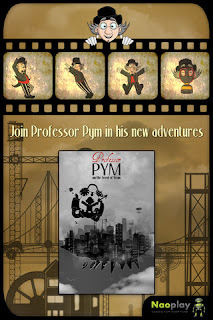 Professor Pym aims to unveil the hidden secret of the city invaded by a toxic steam and needs your help in his new adventures! You’ll need to jump from wheel to wheel and be the fastest to reach the finish line or take your time and collect all the bolts on your way, never forgetting to keep an eye on the toxic fog! Requiring just one finger to play, the Professor Pym and the Secret of Steam is extremely challenging and requires you to collect as many coins as possible through the 50 exciting stages! The collected coins can be spent in the game store! Successful users will also able to unlock bonus items to boost up their character! Along with the extremely involving gameplay, Professor Pym and the Secret of Steam takes you to the on a journey in pure steampunk universe by the music and high quality draws! More than 30 achievements await fruitful users to salute their performances, while the US players are even able to win real prizes simply by playing!! Once you achieve success, you’re able to compare your progress in the game with the best players worldwide, in real time with the global Hall of Fame! Moreover, you can your friends’ progress with the Apple Game Center and even share your fame on Twitter and Facebook account. Professor Pym and the Secret of Steam is available in the Apple App store and requires iOS 3.1.3 or later to be functional. So go and grab the game and help Professor Pym unveil the hidden secret of the toxic steam city!